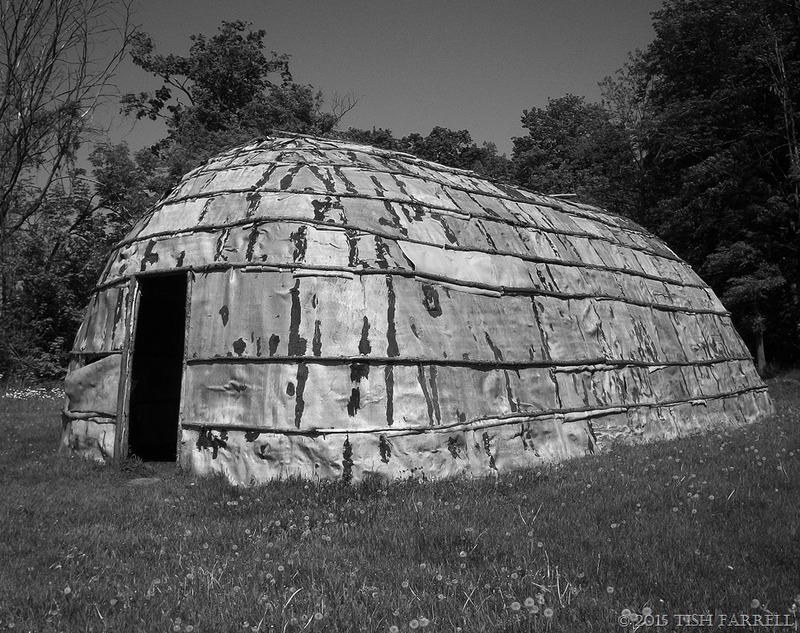 We came upon this reconstructed Iroquois longhouse when visiting the Museum of Ontario Archaeology in London, Ontario. It stands next door to the museum, on the Lawson site, where the remains of a 500-year-old fortified Neutral Iroquois village were discovered in the 1920s. Since then over 30,000 artefacts have been recovered, along with traces of 19 long houses and a long section of palisade. It is thought that around 2,000 people once inhabited the five acre site. The village sits up on a flat plateau above Medway River and Snake Creek in northwest London, a good defensible position with access to fresh water and fishing. From the late 1400s there seems to have been an increase in inter-tribal conflict, made worse later by the arrival of Europeans, who among other things, sought to control the fur trade. Around the 1650s the Neutral Iroquois were defeated and dispersed by the New York State Iroquois, leaving south western Ontario empty until the early 1700s when the Ojibway moved into the area. The Iroquois called and call themselves Haudensaunee. (See the Haudensaunee Confederacy website for more about their culture). I read that this name translates as: ‘People of the longhouse’. It is a fitting name for a culture whose architecture so clearly defines their communal ethos. Traditionally, longhouses were as long as there were extended family groups to occupy them – between 60 and 300 feet. The frame was made of bent saplings with a span around twenty feet wide and high. On either side the door, platforms ran the length of the house, with one family to every section. Every two families facing one another across the corridor shared one of many central hearths. The Lawson example, though, is apparently more typical of longhouses found in northern Ontario since it uses a covering of birch bark rather than elm that was used in the south west. 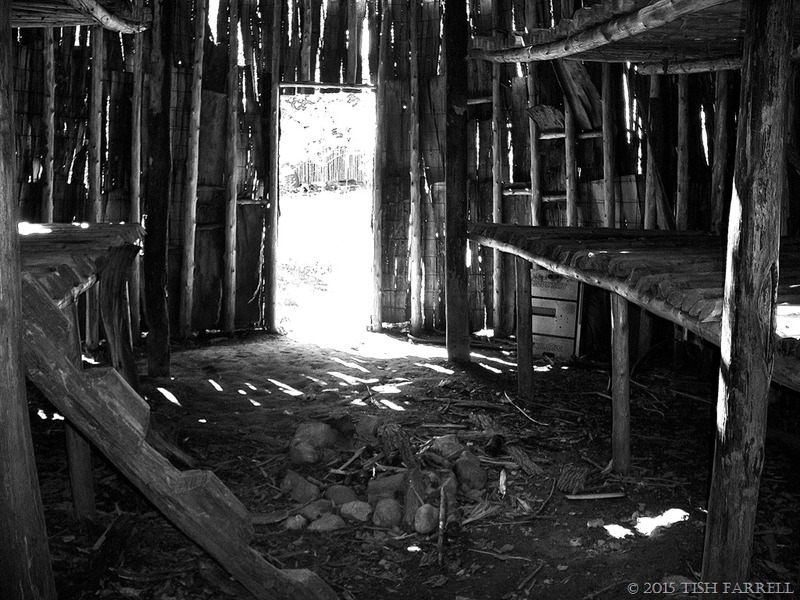 It was strange, but the Lawson longhouse felt very lonely. Perhaps it was because there was only one house on a site where there should have been several. Inside, too, there was a curious sense of abandonment, and this seemed odd for a reconstructed exhibit. There was no one else around on the day we visited, just the spring breezes in the surrounding scrubby woods. Even now, several years on, I can still feel the great sense of sadness that I experienced as I walked around the site. I had earlier been told at London’s Fanshawe Pioneer Village that before the European settlers arrived, south west Ontario was a land of monumental trees, and as soon as I heard this I began to regret their loss. It was also a land of peoples whose values and customs were often greatly misrepresented and wilfully eradicated by the newcomers. 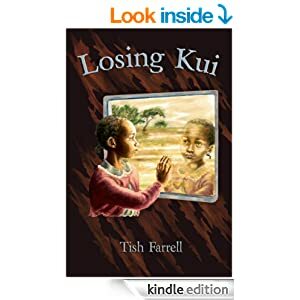 I felt the loss of them too, and also the sense that we had missed something very important by not understanding better how the ‘first people’ lived in the once majestic landscape, that is now so very cleared and broken in, and in many places, downright ugly with viral shopping malls, diners and freeways. Posted on January 16, 2015 January 16, 2015 by Tish Farrell	This entry was posted in anthropology, Archaeology and tagged bark house, Cee's Black & White Photo Challenge, cultural history, First Nations, Haudensaunee, Iroquois, London Ontario, photography, Tish Farrell Writer. Bookmark the permalink. Oh what a cool entry you have for this week Tish. I really love the bark walls. Thanks so much for contributing. I thought you would like this, Cee – the bark walls are rather magical aren’t they – I mean the idea of using bark in the first place. Thanks as always for the prompt which made me hunt for these pix. thanks for this interesting post. Unfortunately I have to agree on your statement regarding ugliness. Thank you, Bihua. Yes, I do think we’re a bit smug about the kind of built environment we have created in the industrialised world. It doesn’t have to be quite so soulless or oppressive. Such a great post and tribute to the Iroquois, Tish. Reading your fine text I can feel the sadness and the loss you describe. Especially since it’s obviously too late to learn from this as the ugly shopping malls, diners and freeways are so well settled. Sad indeed. Thank you, Dina, for your thoughtful comments. Have a great weekend too. They were amazing people and also very fierce warriors. Yes, there seems to have been quite a bit of warfare as time went on – as ever with humans (I imagine) – competition for resources. But that may not be all the story. Early garden apartments? Condominiums? I always thought the long house was a rather pleasant way of living. Communal, but not on top of each other. Then … there are the Pueblo for early high-rise living. Great pictures. That’s a good interior picture. It gives a much better idea of size. Glad you think the interior shot works. I only took the 2 photos because the sensations of the place were bothering me. But longhouses have a lot to be said for them. Our cottage is a sort of longhouse, though we definitely don’t share it with extended family – at least not for sleepovers. All the rooms lead into each other on both floors and there’s a staircase at each end. G and I can follow each other around the house, only glimpsing, but without quite meeting. On fast moving days, he thinks there are two of me. Thanks for this great post, Tish. I feel sad too thinking of their, and our, loss. I can relate to the sadness you describe – felt the same thing when I visited various museums and Native sites in the American SouthWest; it was a pervasive feeling that seemed attached to the structures and artifacts, no matter how beautiful or well preserved they were. A wonderful image for this challenge and a very interesting and poignant post. As I read through your words I could imagine and relate to the sadness you describe. I often feel what we call ‘progress’ is so out of step with the natural world that the early people understood so well, that ‘progress’ hardly seems an appropriate term. Thank you for your very thoughtful comments. One of the things I find so frustrating is that we tend to think ourselves so much more civilized than our predecessors, and thus tend not to see what we might have lost. I think we could certainly have learned a great deal from peoples of the past who were so much more in touch with the earth and its rhythms. Tish I love this and though it’s abandoned can you imagine living with multiple families? Oh boy! I liked the bark house, imagine having a smaller version in the back garden? Agree on the sentiment that we missed out on appreciating others way of life… oh well.